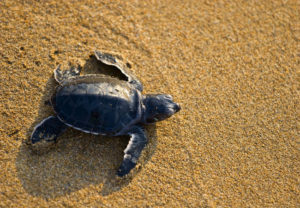 St Lucia turtle Tours (iSimangaliso Wetland Park) begin in November when Loggerhead and Leatherback turtles come ashore on the golden beaches in the St Lucia Turtle Sanctuary, to lay their eggs. On the St Lucia turtle nesting tours we drive along the beach (iSimangaliso Cape Vidal too Leven Point) at night in search of turtles. At certain stages during the nesting process, turtles can be approached, viewed and photographed without causing disturbance to the turtles. Once the female Loggerhead and Leatherback turtles have nested, the eggs incubate for about 65 days, depending upon nest temperatures. On St Lucia turtle hatchling tours, we drive along the beach in the turtle sanctuary with very dim flashlights looking for baby turtles as they move down the beach towards the ocean. If you are going to be in South Africa in the St Lucia area, this is a phenomenon not to be missed. 2014 Shoreline Boat Turtle and Walking Safaris have officially been awarded with the Turtle Tour concession for the iSimangaliso Wetland Park area. The commencement date for the Turtle Tours is 12 November 2014. The tours will depart from St Lucia and please do take note that the times vary according to the tides and therefore each evening will vary. Its an incredible tour with the benefit of being able to witness two separate types of Turtles that frequent the beaches of St Lucia, these include the Logger Head and Leather Back Turtles. Please do take note that sightings are not guaranteed as the same applies to a safari into any game reserve. What is incredible is that one will travel through the Eastern Shores of iSimangaliso Wetland Park enroute to the beach at Cape Vidal while traveling to the beach one also has the added benefit of coming across various animal species that frequent the area these include Hippo, Buffalo, Rhino, Antelope and even the odd Leopard. Once you arrive at the Cape Vidal beach your guide will deflate the open game drives tyres and then you are officially off on a Turtle Tour along the beach, the stretch of beach that you will 4×4 on is a reserve and the distance that you will travel is aprox 27km before you get to the sanctuary. It is along this stretch of beach that you will be looking for the turtles. From November the Turtles start to lay their eggs and once the incubation period is complete then only will the hatchlings depart into the water never to set foot onto land again in the case of the males. Did you know that when the females are ready to lay their eggs that they will always return to their birth stretch of beach never mind where in the ocean they are. Turtle Tours are an incredible and magical outing definitely a once in a life time experience should you be interested in booking this tour then please do Click Here for prices and availability. Seats are limited to 10 so please do ensure that you have made bookings prior as the Turtle Tours do coincide with High season in St Lucia. We are incredibly excited to mention that during our current season of 2015 that the sightings have been awesome thus far not to mention that our success rate currently is more than 94% for Leopards. This is amazing as it adds so much more value to the extraordinary outing as it is. Why not join a Turtle Tour while in iSimangaliso Wetland Park , St Lucia and not only get to witness the Turtles, Leopards but some magnificent scenery as well. Turtle Tours are conducted on the Eastern Shores of iSimangaliso Wetland Park. Accessing the Eastern shores is done by entering the Cape Vidal gate from St Lucia. The Eastern shores borders the Indian Ocean on the East and the St Lucia Estuary on the West. Traveling to Cape Vidal is a 28 km journey prior to one being able to access the beach. What makes the Turtle Tours even more spectacular is the fact that one has the opportunity to enjoy a Night Drive Safari both en route and back to St Lucia on completion of the Turtle Tour. While en route one may come across various wildlife species including Leopard, Buffalo, Rhino, Hippo, Antelope and smaller nocturnal species such as Chameleons. Its a magnificent outing in an incredible park. The 2015/2016 Turtle Tour Season (area: St Lucia/iSimangaliso Wetland Park) has truly been a magnificent season thus far. November 2015 started of with splendid sightings of Leopards virtually each evening. Furthermore our Ranger Jacques was fortunate to spot more than 1 Leopard on most nights in and among-st other Nocturnal wildlife. The Turtles started showing themselves from mid November and continued throughout the season. Leatherback Turtles and Logger Head Turtles where witnessed on numerous occasions throughout the season. December Leopard sightings dwindled a bit due to more traffic on the Cape Vidal road but quickly increased after the festive season. As of late January a lot more LeatherBack Turtles had been witnessed with numerous Logger Head hatch-lings. LeatherBacks are the largest turtles on earth. As their name implies their skin is thin, tough and rubbery. Made up of thousands of bone plates that gives an impression of leather. The LeatherBack is the only turtle that does not have a hard outer shell. The length of a adult Turtle can be up to 2,7 m long. Scissor like jaws, jellyfish is the main diet of this magnificent creature. Female Turtles between the ages of 6 and 10 years will mate every 2 to 3 years. A female may lay her eggs up to 9 times during one season with an average of 10 days between nestings. Incubation is between 55 and 75 days.